After rocking our site's previous design for nearly four years, it was time for a refresh. Actually complete overhaul is more like it, a top-to-bottom restructuring and streamlining of DigWP.com. Going into the redesign, the goal was twofold: 1) visually keep things as focused and clean as possible, and 2) under the hood, unify everything and simplify down to an absolute minimum. As with any eight-year-old website with over 400 posts and integrated e-commerce system, there was an enormous amount of work required to get the job done. Digging Into WordPress update! The book is now current with the latest version of WordPress, 3.8 "Parker". The Parker update is focused primarily on improving the appearance of the Admin Area, along with the usual blend of bug fixes and enhancements. As with all DigWP updates, the new version is a FREE download for everyone who owns the book. Digging Into WordPress update! 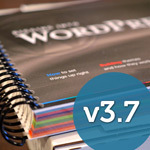 Version 3.7 of the book is updated for WordPress 3.6 and 3.7 (beta). As with the previous 10 updates, everyone who owns the book gets the new version for FREE. Well sort of.. more like a design "refresh" really. DigWP.com launched in May 2009 with its first (brown) design. Then later that year the site was redesigned for the launch of the book. The second (blue/grey) design was well-suited for the site and a natural progression from the first design, and the new design continues along the same path. 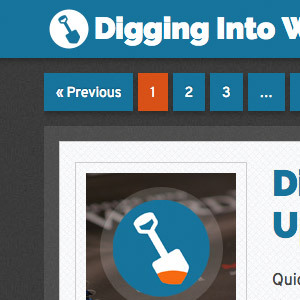 Digging Into WordPress version 3.4 is here! 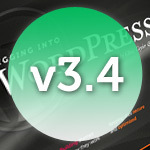 The DigWP v3.4 update covers WordPress 3.4 (Green), with new and revised content throughout the book. This is the book's 10th Edition, making version 3.4 more fluid, focused and current than ever. It's also a free update to everyone who owns either print or digital versions of the book. Read on for a sneak peek and summary of the book's features..
New version of Digging into WordPress now available! The DiW v3.3 update covers WordPress 3.3 & 3.2, with fresh new sections and updated content throughout the book. Similar to the latest versions of WordPress, DiW 3.3 refreshes the look and feel of the book, with updated graphics and screenshots, streamlined content, and new bonus versions of the PDF. As the 9th Edition of the book, Digging into WordPress 3.3 is more fluid, focused and current than ever. This is a free update to everyone who owns either version of the book. The Stop Online Piracy Act and the Protect IP Act will make things worse online by imposing unnecessary regulation over the Web. To protest these two horrible bills, major websites (including Google and Wikipedia) will "blackout" their content on Wednesday, January 18, 2012. We're joining in too, and will be shutting down DigWP.com on that day. You too can get involved and let your voice be heard! To make things easy, here is a list of stop-SOPA/PIPA plugins to help blackout your WordPress-powered site. DigWP Poll Results, Book News, and More! We've had several polls going in the DigWP.com sidebar for quite some time now, and it's been interesting watching the trends change over time. The first and longest ongoing poll is HTML or XHTML for Markup?, which now has over 7,000 votes. This quick post summarizes some of the poll data we've received so far, and also covers some news about the book and website.